Much of our time in the next month or so will be spent preparing. We have been following several Blogs over the last year, learning from the experience of others. These folks have spent multiple years on the road. Here are some of our favorites. WatsonsWander This is a couple who refurbished an Airstream trailer, and have been on the road for since 2012. I like the idea of refurbishing an Airstream, but like the idea of traveling better. It is one of the reasons why we purchased a new trailer. I do like their set-up though. It reminds me a lot of what we should look like traveling down the road. We are bringing along bike and kayaks too. Gone With the Wynns These guys began traveling in an RV and sharing not only their adventures, but lessons about what they have learned, what equipment works best, and places to visit. They recently traded the Motor Home for a Sail Boat. They are full of great ideas, and really fun to follow. The Greatest American Road Trip - 59 Parks in 52 Weeks Jonathan and Stefanie embarked on an epic road trip last year, visiting all 59 national parks in 52 weeks, in celebration of the centennial of the National Parks Service. One of our goals is to visit, not only these parks, but the many national monuments that find them selves in our way. Modern Nomad - Outside Online I recently found this blog from a couple who recently began traveling full time. They have great ideas, lessons and adventures. The RV Mobile Internet Resource Center is a must resource for anyone hoping to stay connected while on the road. Many experienced nomads and full timers who I have looked into have recommended this as a resource. Not only have Chris and Cherie been full timing for about a decade and have a wealth of information, they are THE go to resource for anything related to staying connected on the road. Weather it is how to get your email, update your Blog, or watch your favorite show, they have the information you need. The annual membership fee is more than worth the cost. 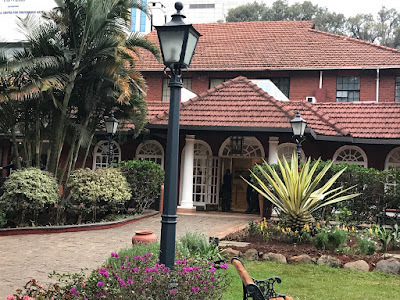 I have learned that staying connected on the road involves using both WiFi and Cellular signals, and boosting both of them. Using the Resource Center, I settled on the following Technology. 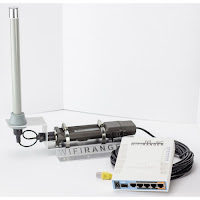 For a mobile router, and a WiFi Booster I settled WiFi Ranger's EliteAC Pack. This setup includes their GoAC Mobile Router, paired with their EliteAC, flat mount booster. The mobile router allows cellular tethering, meaning the router will handle both WiFi, and cellular signals, creating a LAN in a and around the Trailer. To boost the cellular signal, I chose the weBoostDrive 4G-M booster kit from WilsonAmplifiers. This will boost the signal for my Verizon Jetpack 4G LTE Mobile Hotspot AC791L by Netgear. The hotspot supports multiple devices, on our Verizon Data Plan, and tethers to the mobile router. 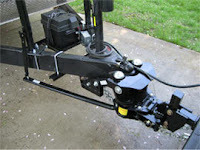 hitch is designed to eliminate trailer sway, by projecting the pivot point of the trailer forward to above the rear axel. The decision seemed to make sense especially since we will be towing our home every where we go. Luckily, I was able to ship all of this technology to Colonial Airstream will install all of this before we take delivery of the trailer in early March. Particularly I wanted them to install the exterior antennas for the WiFi and Cell boosters. In speaking to the technician, he knew everything I wanted to install and assured me that they do several of these installations weekly. I have been busy working on the tow vehicle as well. Since the truck will be our main storage area I have spent considerable thought on how I would like to set it up. The topper is an ARE V Series topper, ordered through Suburban Toppers in Denver. The toppers is a basic model that allowed me to customize it to fit our needs. I added solid "windoors" on both sides, allowing us to access items in the bed from the side of the truck. 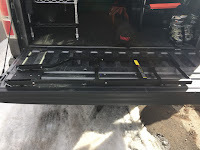 On top, is a Yakima Rack, where we will carry the kayaks. Inside, we installed a single strand of LED lighting, that comes on once the back window is opened. In addition, we have a 12V power block. To organize the inside better, we customized modular steel shelving from The Container Store which allows us to store boxes and bags more efficiently. 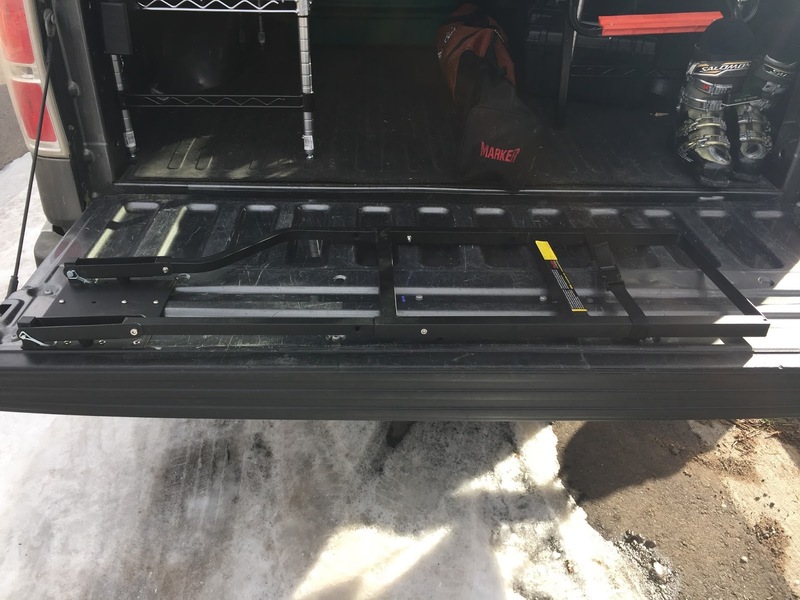 Access to the truck bed, and roof rack is made easier by the Traxion Tailgate Ladder and a Viking Solutions Tire Step ladder. Both seem to be cost effective solutions that will travel nicely.